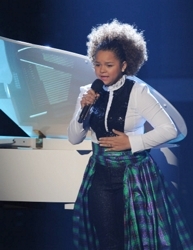 Rachel Crowe is the mega-talented young teen on the first season of X-Factor. Luckily for ringlet fans, her hair has been styled in a beautiful array of curls, coils and natural ringlets from the beginning of the competition. Maybe Rachel’s beautiful hair texture has been emphasized because she is being coached by Simon Cowell. Or maybe the hairstylists for the Fox show understand how beautiful her natural ringlets are. She has been showcasing her curls in a wide array of hairstyles ranging from wearing them loose and au natural to pulled back to different side and help back with headbands. 1. Cleanse detangled hair in lukewarm water. Be sure to get hair very wet before applying a hydrating cleansing formula. If your hair is naturally curly or textured you may wish to utilize a modified cleansing routine such as a Diluted Shampoo (DS), Conditioner Only Wash (COWash), Water Only (WO) or similar.